Short Fiction Monday: Our exploration of free and inexpensive short fiction available on the internet. Here are a few stories we’ve read that we wanted you to know about. 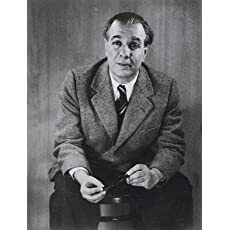 Our detective is Erik Lonnrot, who with his Lestradian colleague Treviranus is called to the Hotel du Nord to investigate the murder of the Jewish intellectual Dr. Marcel Yarmolinsky. Yarmonlinsky’s last words, typewritten on a single sheet, are “The first letter of the Name has been uttered.” From this striking beginning we go on to some pretty hilarious asides, an ironic interrogation of the detective story in general, kabbalistic mystery, dramatic geometry, vengeance and violent death. In this “What happened next?” take on “Snow White and the Seven Dwarfs,” Fairest (Snow White) is married to her prince and living with him in his castle. They have a lovely, golden-haired seven-year-old daughter. And they have Fairest’s stepmother, imprisoned in their castle, along with the magic mirror that originally began all the trouble. Fairest visits her stepmother each month, when they share an apple from a magical tree (presumably grown from the poisonous apple of the tale) along with their latest idea of a gory, imaginative way in which to kill each other. The stepmother also warns her about the unspeakable intentions of Fairest’s husband, the prince, toward their daughter. Whether to believe her? The magic mirror might answer, but Stepmother warns Fairest against that as well. “Triquetra” is a dark subversion of the Snow White fairy tale, raising challenging questions about trust and the ways in which people can be misled. 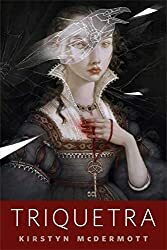 It’s imaginative, with vivid writing, but disturbing on several levels, not the least of which are the creative murder methods dreamed up by Fairest and her stepmother, which are used as a grisly framing device. I liked the way in which the stepmother’s character was recast, and the ultimate resolution of the story. 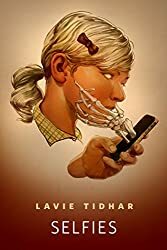 “Selfies” is definitely a modern horror story by Lavie Tidhar — a young woman, Ellie, is running from something terrible at night, pursued by a mysterious “they,” though still snapping selfies as she flees for her life. Then, the reader discovers, Ellie seems to have gone mad and died (though it’s not the last anyone sees of her). So how did this all begin? Tidhar reels the narrative back to when Ellie finds her way to the nearly-abandoned back end of a mall, where an aggressive salesman convinces her to buy a sleek, thoroughly upgraded mobile phone. Ellie’s new phone makes her happy, at first, but the more selfies she takes, the stranger things get and the more she sees a twisted mockery of her own face in places where it should not be. In the picture something with my face is standing outside and it’s looking back at me and it’s smiling. 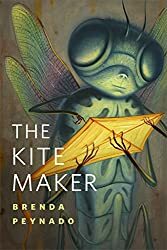 “The Kite Maker” is an alien invasion with a reverse twist: when the alien ships landed, humans attacked the dragonfly-like aliens who emerged from the ships, killing and maiming many of them. Eventually humanity figured out that the Dragonflies were friendly refugees from a dying planet and allowed them to settle among us on Earth. But shame, prejudice and xenophobia have made the arrangement an uneasy one. The narrator, a kite-maker and -seller whose homemade kites are adored by the Dragonflies, struggles with her own feelings and fears. Gen is a refugee, newly arrived in Novapolis, a gleaming white, beautiful city with “custodians”: “small white spheres that moved through the air like schools of fish.” She’s on a floating balcony, looking over her new home, when a stranger appears on her balcony who has some thoughts to share about life in Novapolis. Unbeknownst to all, including himself, NATHAN OKERLUND has been preparing for the role of "reviewer of fantasy novels" since he first read Watership Down thirty-odd years ago. He is especially fond of Gene Wolfe, Jack Vance, Steven Brust, Neil Gaiman, and books that have to be read twice to be understood at all, but will happily read anything which does not actually attempt to escape the nightstand. When not occupied with the fantastic he takes brains apart to see how they work, as a postdoctoral fellow studying neurodegeneration, and supports his wife and daughter in their daily heroics. JANA NYMAN, with us since January 2015, is a freelance copy-editor who has lived all over the United States, but recently settled in Colorado with her dog and a Wookiee. Jana was exposed to science fiction and fantasy at an early age, watching Star Wars and Star Trek movie marathons with her family and reading works by Robert Heinlein and Ray Bradbury WAY before she was old enough to understand them; thus began a lifelong fascination with what it means to be human. Jana enjoys reading all kinds of books, but her particular favorites are fairy- and folktales (old and new), fantasy involving dragons or other mythological beasties, contemporary science fiction, and superhero fiction. Some of her favorite authors are Bradbury, James Tiptree, Jr., Madeleine L'Engle, and Philip Pullman. In fairness, it would be hard to improve on “With Folded Hands”. I still remember vividly how “With Folded Hands” appalled me when I read it in my 20s, years ago. It’s part of the 2-volume Science Fiction Hall of Fame novella collection, where I also first met up with “Who Goes There?,” “Vintage Season,” “The Moon Moth” and several other marvelous classic SF tales. Hey, that’s where I read it too! What a great collection. I stole Volume 1 of the SF Hall of Fame (the short stories) from my dad when I moved out of the house years ago, hah. The two volumes of novellas I bought on my own. They’re all excellent collections. I cut my SF teeth on Volume 1, and it’s probably a major part of the reason I’m a lifelong SF fan. Also where I came across many of my old favorites.